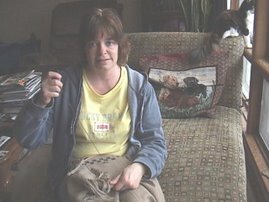 Nicole's Needlework: Where do I begin?? Warning - long post! Anyway, Friday we dropped two out of three boys at my MIL's house and we drove up to Jacksonville. I got up early Sat. and went to a couple shops in the area. The first one Olde Green Cupboard was very cute. It was mostly quilting, but they had a small section of cross stitch. Most of the charts were Blackbird Designs and Carriage House Samplings. 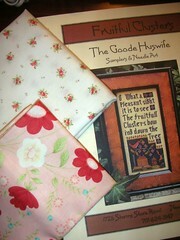 I found one Goode Huswife that I didn't have "Fruitful Clusters" and some fabric for my mom and I. After that I went to A Stitch in Time. It was a pretty nice shop. They had yarn, needlepoint and cross stitch. I didn't see anything that I couldn't live without, so I left without buying anything. I went back to our room and my dh saw online that a Hooters near us was showing the UFC fight and he had to go! So we went there for lunch. We didn't stay for all the fights (thankfully). After that I told him I wanted to do a little sight seeing. 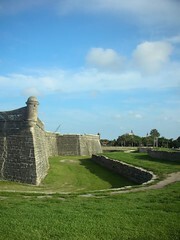 So we headed down to St. Augustine. It's very pretty, but a little too touristy for us. We liked the fort, but unfortunately it was closed. I figured we could go next time we're in the area. After St. Augustine we decided to put our feet in the ocean for a bit. 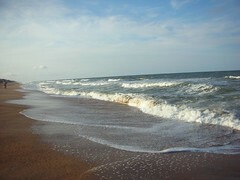 What a difference the Atlantic is from the Gulf of Mexico where we are the waves. The waves are huge and you could hear them crashing from much further away. And my next stop was the Russell Stover Outlet. 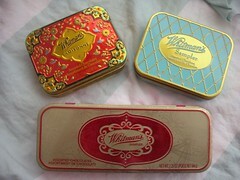 I had to see if they had any Whitman's tins and they did! Cases and cases of them! So I got three cases of these ..
My last little bit of news is Kathy Barrick-Dieter from Carriage House Samplings received my stitching and sent me some charts. Well, not just some charts... she sent me ALL of the charts I had on my wish list! I couldn't believe it! I told her just one or two charts would be fine. I was just amazed when I got the package today. Don't you just love shop hopping?! You've made out like a bandit, too. Congrats! It looks like you had fun, look at all of your goodies! 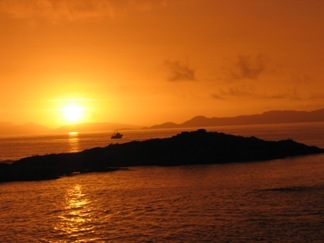 The photos are really nice too. 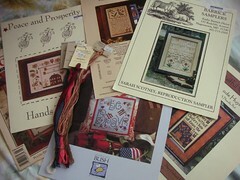 Great charts you received for your stitching too, how nice to get that many, can’t wait to see you stitch them up. Sending get well hugs to your mom! I hope she is better soon!! 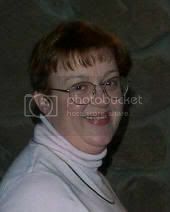 Hope your mom feels better! Your trip sounded very relaxing-nice stash too. How cool to get all those charts off your wish list from Kathy. Fabulous stash! 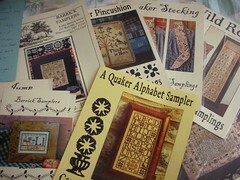 And how wonderful that Kathy sent you all those beauties for your stitching. Beautful pics and wonderful stash. I sent you an e-mail about the tins...I have the patterns, and have been looking for some of these!